Winter isn’t just the season for planning summer vacations. It’s a time when many families are getting outside and trying new things. And we, of course, are no exception. Trying new things is what keeps life interesting and fun, right? 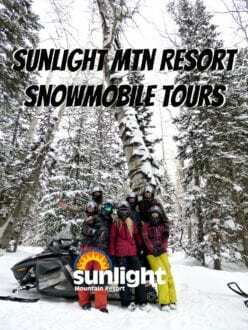 As a family that loves spending time together and having fun, we decided this winter was the perfect time to contact our local ski area, Sunlight Mountain Resort to try having a go on a snowmobile. Oh my gosh, so much fun! Have you ever been? It is a fun activity for the entire family! There are just a few things you need to know before you go. Adventure is our middle name. We crave it like some crave luxury, or downtime. We love what it does for our perspective on life, what it does for our closeness as a family, and what it does for our energy level. Adventure simply makes life fun, and wild, unpredictable and exciting. It makes you eager for the next day like nothing else can. And adventure is the best all natural anti-depressant ever discovered. We are equal opportunity adventurers, and variety is the spice of life, so incorporating new and exciting activities into our adventures is always a bonus. Snowmobiling was definitely an exciting new adventure for our family that lives up to the hype. We love the seasons because, with the change of weather, each season brings something new and spectacular to enjoy. In the spring we love hiking and whitewater kayaking. Summer brings climbing, surfing and whitewater rafting. In the fall, dirt biking, mountain biking and camping. In the winter, we love snowboarding and sledding. 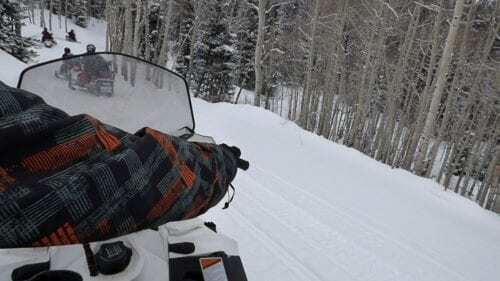 Now we can add snowmobiling to our ever growing list of favorite family adventures! We piled in the SUV and headed 20 minutes outside of Glenwood Springs, Colorado up toward Sunlight Mountain Resort, where we spend the majority of our winter days, riding the fresh powder, hitting the terrain park challenging our bodies and skills in ways that keep us young and nimble. 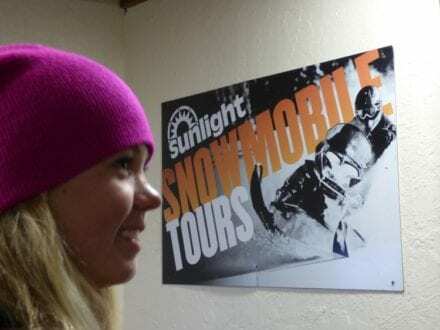 The Snowmobile Tour office is situated in the basement of the newly remodeled Sunlight Lodge Bed and Breakfast. A few snowflakes were falling and the sky was overcast, teasing us with the possibility of a storm. We were all filled with energy and were super stoked to get on the sleds and enjoy a day in the backcountry! 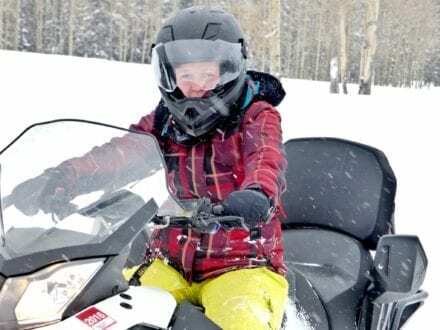 A one-hour, 16 mile family tour that starts at the Sunlight Lodge Bed & Breakfast and, “winds you deep into the White River National Forest, through a lush forest of tall pines and stunning Aspen groves.” — Sunlight Mtn Resort. It turns out the Adventure Ride was the perfect mix of adrenaline charging speeds, beautiful scenery, hills and turns, in fact, we left nothing on the table. The only thing we wished we had more of was time because we had that much fun! Our Sunlight Tour guide, AJ, was totally epic. He knew we were mostly first-timers and gave us a quick safety talk and showed us the throttle and the brake, the kill switch and the ever important hand warmers on the handlebars. And then literally 5 minutes later, we were cruisin’ the trails! AJ was super awesome, he immediately recognized that while we didn’t have a ton of experience, we had a ton of enthusiasm and a need for speed. He didn’t baby us and we had free reign on how fast or how slow (not even a factor), where we stopped for photos and how long we hit it up at Baylor Park … thanks AJ!! You see, yesterday was yet another “Best Day of our lives,” as that is our daily goal. Make today better than yesterday. 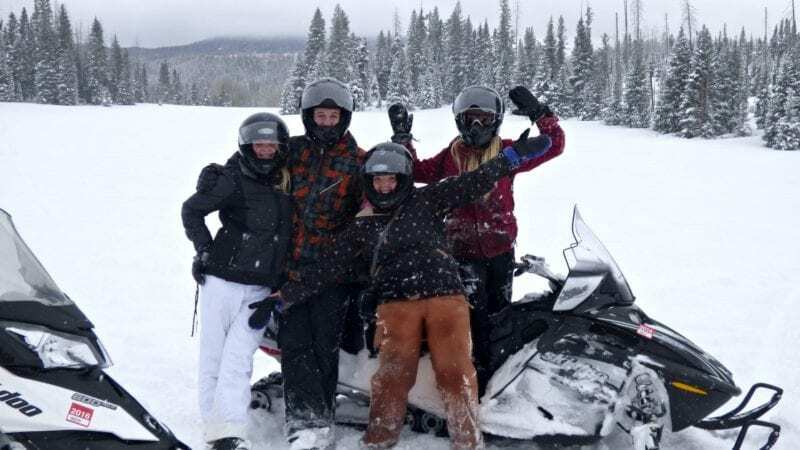 And that is why we chose to hook up with Sunlight Mountain Resort (which just happens to be our favorite family ski area in Colorado) to take a snowmobile tour! Talk about an adrenaline rush, talk about tons of hooting and hollering and even some overcoming of fears and discovery about oneself! The majority of us have a charge ahead personality. We leap before looking, we are up for anything at anytime, but there is one absolute beauty of a person in our family who tends to fight fear a bit more than the rest of us. And that beautiful person is our oldest daughter, Kerry. 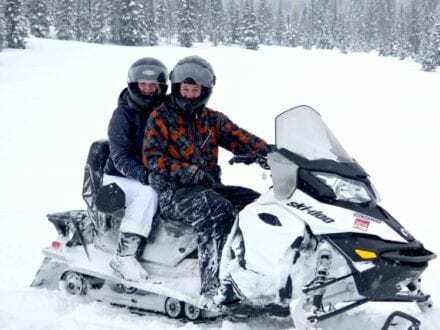 Kerry wasn’t sure if snowmobiling was going to be safe, let alone fun. In fact, she said multiple times that she was just going because we obviously wanted her to, but she wasn’t “going to have any fun”. But after only a few minutes in, Kerry was having a blast! 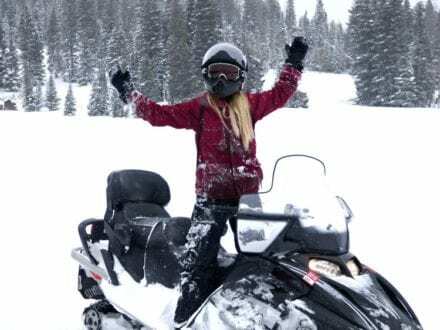 Her smile made it apparent that she was wrong in her assessment of the sport of snowmobiling. The air was crisp, she was surrounded by some of the people who love her more than anyone else and she discovered she was in complete control. She didn’t have to hit 55 mph if she didn’t want to. While the rest of us were pushing our sleds to their fullest, Kerry was cruising along at 45. We would just stop and wait for a few seconds every couple minutes so she could catch up. No pressure from neither the guide nor us. I mentioned AJ earlier and he was awesome. He didn’t give us newbies too much information, just told us the basics and got us riding as quickly as possible. During the tour he answered our questions and helped take group photos, pointed out some super epic spots for the same, but he wasn’t in our faces, chatting it up. 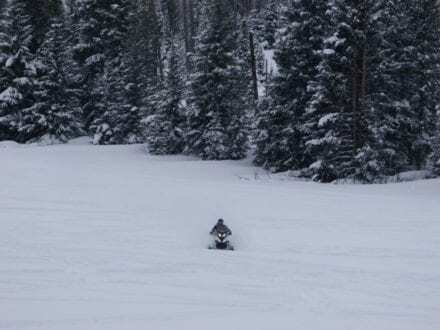 He was so chill and we had so much freedom, he even let us spend a little extra time tearing up Baylor Park … the huge, vast area where you are literally free as a bird to throw as much snow as possible and ride as fast as the sleds will go! Baylor Park was uber fun, and AJ recognized our need for speed, and so as we left, he asked if we wanted to take the fastest route, where you could full throttle the snowmobile or the more scenic route with inclines and declines and twists and turns. Surprisingly we were all about the scenic route. I’m so glad that even during an adrenaline rush adventure we have learned to stop and take in as much of our surroundings as humanly possible, because oh my gosh! The views, coupled with the crisp mountain air and the serenity found only in nature … this tour was exactly what my soul needed to start a new year off. It was the perfect mix of excitement and awe dropping beauty. 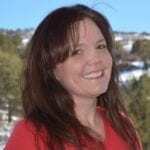 The aspen and pine forests are spectacular, the mountain views are breathtaking and, with few sightings of actual people, you truly feel like you and your family are the only people alive. What struck me as totally amazing about snowmobiling was that we were able to go where truly few ever do. 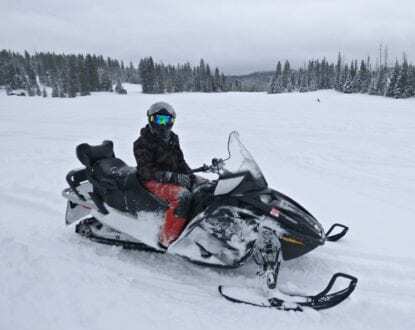 Snowmobiling gives you more access to the backcountry than any other mode of transportation, so you truly are experiencing things that very few others ever will. Taking the road less traveled, if you will. Seeing the largest aspen tree in, quite possibly, the world. \Listening to nothing but the slight wind as we stood in the midst of an aspen grove, feeling totally and completely free, smelling the fresh mountain air, tasting fresh fallen snow to quench our thirst … every one of our senses were awakened during those wild, yet peaceful moments out in the wilderness. No lie, stress most definitely evaporates into the air during a snowmobile tour. There is so much excitement, so much to see, so much to do, you are in the zone, thinking of nothing else but the present moment. Nature has a funny way of refocusing our thoughts, of helping us forget our worries and concerns and, instead of engaging in all that wasteful energy, changing our perspective into one of gratitude! 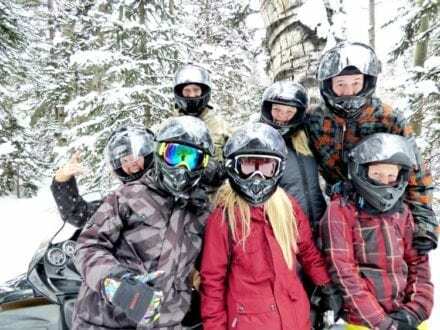 Snowmobiling brings families together.For our family, bringing together our slightly hesitant 22 year old daughter, our newly engaged 19 year old son, our too busy for anything 18 year old son and our never ever miss an adventure 17 year old daughter for a snowmobiling adventure was nothing short of epic. They all literally dropped everything and we all hit the trails together! Our son’s fiancee even joined in the fun! Together is my favorite word. It means united and what better way to unite as a family than outdoors, in nature and if you can add a little adventure, some adrenaline, heck that just makes together all the better, doesn’t it? Dress in layers. If you get too hot, it’s easy to remove clothing. Helmets are provided, but feel free to bring your own, if you wish. You need to be 16 to drive and children 4 and older are welcome as riders. Check-In at the Sunlight Lodge Bed & Breakfast, on the left just before the ski area.. This snowmobiling adventure was amazing!! This is a must do while at Sunlight Resort! Tyler, Steve, and Bob are outstanding tour guides!! We came to ski and snowboard, but the snowmobiling was definitely our favorite part of our vacation. I can’t say enough about our tour guides, they made our experience memorable! !